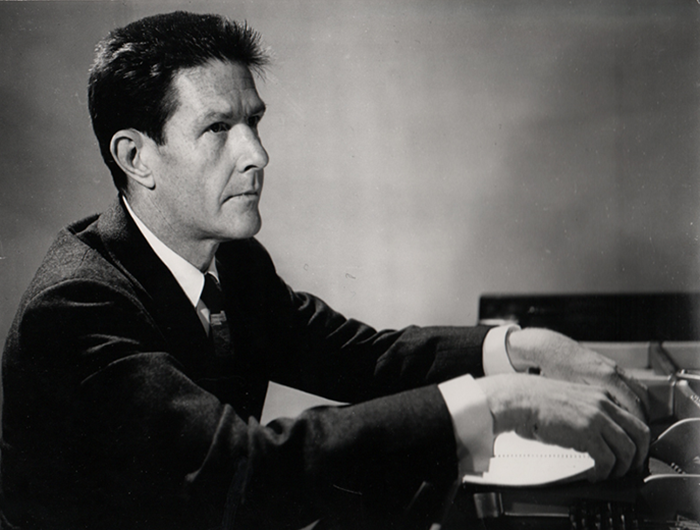 John Cage was born on September 5, 1912 in Los Angeles, California and died in New York City on August 12, 1992. He studied liberal arts at Pomona College. Among his composition teachers were Henry Cowell and Arnold Schoenberg. Cage was elected to the American National Academy and Institute of Arts and Letters and received innumerable awards and honors both in the United States and in Europe. Beginning around 1950, and throughout the passing years, he departed from the pragmatism of precise musical notation and circumscribed ways of performance. His principal contribution to the history of music is his systematic establishment of the principle of indeterminacy: by adapting Zen Buddhist practices to composition and performance, Cage succeeded in bringing both authentic spiritual ideas and a liberating attitude of play to the enterprise of Western art. His aesthetic of chance produced a unique body of what might be called "once-only" works, any two performances of which can never be quite the same. In an effort to reduce the subjective element in composition, he developed methods of selecting the components of his pieces by chance, early on through the tossing of coins or dice and later through the use of random number generators on the computer, and especially IC (1984), designed and written in the C language by Cage's programmer-assistant, Andrew Culver, to simulate the coin oracle of the I Ching. Cage’s use of the computer was creative and procedural, and resulted in a system of what can easily be seen as total serialism, in which all elements pertaining to pitch, noise, duration, relative loudness, tempi, harmony, etc., could be determined by referring to previously drawn correlated charts. Thus, Cage's mature works did not originate in psychology, motive, drama, or literature, but, rather, were just sounds, free of judgments about whether they are musical or not, free of fixed relations, free of memory and taste. His most enduring, indeed notorious, composition, influenced by Robert Rauschenberg's all-black and all-white paintings, is the radically tacet 4'33" (1952). Encouraging the ultimate freedom in musical expression, the three movements of 4'33" are indicated by the pianist's opening and closing of the piano key cover, during which no sounds are intentionally produced. It was first performed by the extraordinarily gifted pianist and long-time Cage associate, David Tudor, at Maverick Hall in Woodstock, N.Y., on Aug. 29, 1952. Since 2007, Avant Media has presented several concerts of Cage’s work. We are eternally grateful to the John Cage Trust and to C.F. Peters for their help, support, and encouragement.